The real name of the palace is Palazzo Ferreria, the palace which replaced the former foundry of the order where the Knights' armaments used to be manufactured. The building site was acquired from the government by Giuseppe Buttigieg and Giovanna Camilleri, both very wealthy, and they erected Palazzo Ferreria in the late 1800s - with the best skilled workmanship on the island. 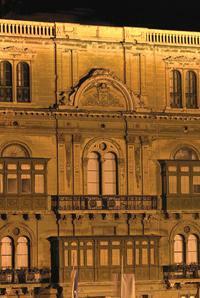 One can see the coat of arms of both surnames Buttiegieg and Camilleri on the façade of the palace on Republic Street, Valletta. The palace was left to their daughter Teresa who married Col. John Louis Francia, a Spanish citizen from Gibraltar. Col. Francia was here with the British army. Palazzo Ferreria is the second biggest private family palace in the city after the President's Palace. It was used and lived in by the family in full-scale employing in-house staff (around 25 persons) until 1947. The staff included two doormen in each door wearing jackets with Maltese silver button uniforms. In 1947 Valletta had been practically destroyed by World War II and the Labour government needed to rent the palace for the Public Works Department, to restore the city from the war ruins. The Francia family accepted the needs of the government and leased it for a good rent then. The family kept the best part of the palace in the agreement - an apartment now used as the Minister's office - to continue living there. In the end the Palace, consisting of shops and government offices, fixed and subject to the "old-rent-law", was sold by the Francia family in 1979 to the government by an amicable special agreement to pay a tax settlement on all the Francia estates for death and duties purposes. Incidentally, when the palace was leased in 1947 to the Public Works Department, the minister was Dom Mintoff. When the Palace was sold to the government in 1979, the Prime Minister was Mr Mintoff. However, had the currently discussed "old-rent-law" existed then in 1979, Francia Estates would have never sold to the government and the palace today would be mine.